As a comprehensive heavy equipment provider, Michigan CAT is the go-to source for the full range of maintenance services in the region. We’re an authorized Cat® dealer offering Scheduled Oil Sampling (SOS) protocol for clients throughout Michigan and the surrounding areas. SOS fluid sampling and analysis plays an integral role in proactive maintenance. It can help reduce downtime and costly repairs while boosting overall efficiency. Our advanced labs give you the ability to analyze a variety of samples including engine oil, radiator coolant and hydraulic fluid. When you choose SOS fluid analysis for your fleet, you can be sure your equipment is ready to perform to the high standards of a genuine Cat machine. Some of the most effective ways to monitor the overall health of your equipment involve testing and analyzing fluids. Through SOS fluid analysis, we can help you detect when components are wearing down by identifying foreign materials in the engine and hydraulic system. These types of advanced indicators tell you when it’s time to perform a service or repair/replace parts and components. 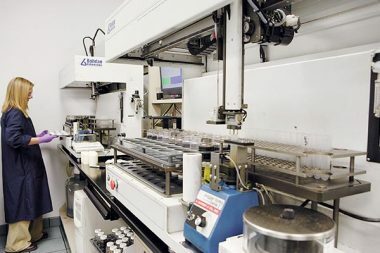 At the same time, fluid analysis also helps you have peace of mind knowing you’re getting the most out of expensive wearable machine components before replacing them. The process of modernizing your maintenance regimen is easy with Michigan CAT. Whether you need to test a single piece of equipment or want to put your entire fleet on an SOS protocol, we can accommodate your needs. 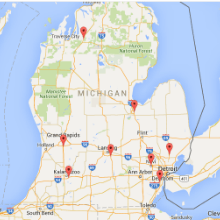 Simply drop off your fluid samples at one of our convenient locations throughout Michigan and the surrounding areas, and we’ll work quickly to perform all tests and analysis. Turnaround is quick, and results are delivered along with a detailed list of recommendations. Regularly scheduled fluid testing is an effective way to ensure the health and productivity of your heavy equipment. For more information about the benefits of fluid sampling, contact a Michigan CAT service representative today. We’ll be happy to answer your questions and demonstrate everything we can do to help your business succeed.